Habaki : Gold folied doble Habaki. Blade length : 70.2 cm or 27.6 inches. Width at the Kissaki : 2.05 cm or 0.81 inches. Era : Edo period, Keian era. Shape : This sword is wide and thick, the proportion is nice. Jigane : Well grained Koitame-hada has Jinie attached, it has fine Chikei. Hamon : Konie-deki, Gunome-midare mixed with Choji-midare. Nioikuchi is deep. There’re many Hataraki inside the Ha namely Ashi, Yo, Sunagashi and Kinsuji, it looks like a Soshuden Koto sword. Boshi is irregular Maru. Special Feature : Swords by Yamato no kami Yasusada are well known for its sharpness, Yamano Kauemon did test cutting with a lot of his swords. They may had the connection with each other. 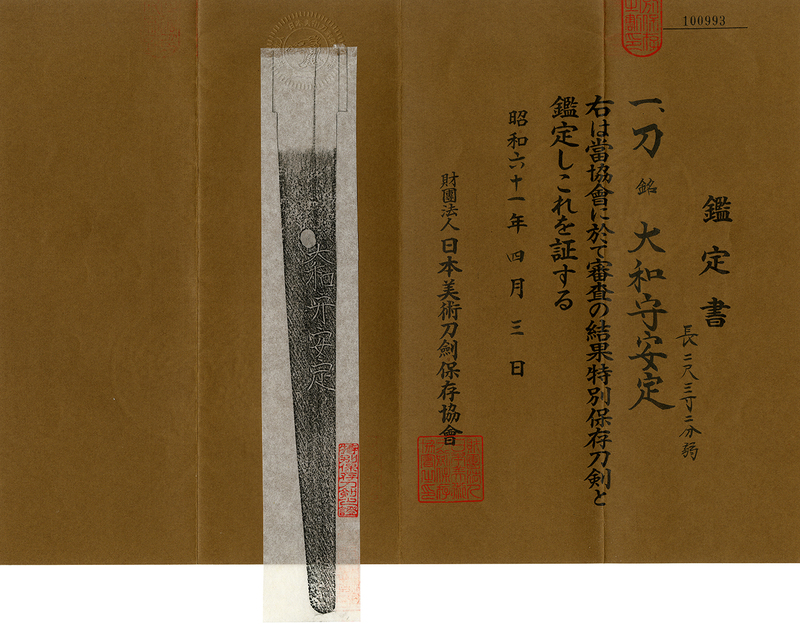 Yasusada’s swords are also famous for that Okita Soji from Shinsengumi used one of his sword. Collectors like his swords because his style is similar to Kotetsu. Tsuba : made of iron, the openwork flying gooses design is carved into. Fuchikashira : made of Shakudo nanakoji, the flowers in the basket is carved into the surface. Menuki : made of Shakudo, the design looks like Mogarashi. From Aoi Art : In Fujishiro book, the sharpness of Yasusada swords is acclaimed a lot. This great Hamon has some characteristics that remind me of Samonji school. The quality of this sword is really well and his swords are on great demand these days.